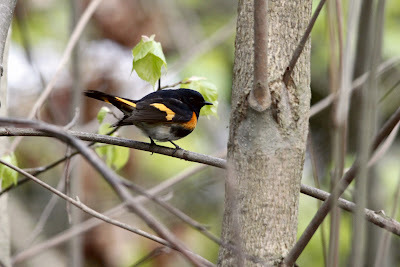 A beautiful male American Redstart. Every May, thousands of warblers migrant through our city in all their glorious breeding colours. Most of the warblers are heading a little further north to find a mate and raise a family before taking the long journey home in the Fall. They do us a huge favor and eat millions of pesky bugs in the process. Rob and I started taking our main two week vacation in May about five years ago, to go birding. It just made sense to us. 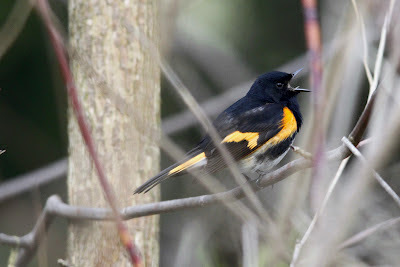 Birding is a hobby we are passionate about and enjoy together. When most people think of vacation, it probably means staying up late and sleeping in the next day. For us, it's up before the sun and to bed not long after it sets. The warblers are most active in the morning and we want to see them. The warblers and other migrating birds light up the trees, shrubs and shorelines in and around our city like jewels for only a short period of time, and for us, they are totally worth getting up early for. PS: Rob takes all the photos, I only carry binoculars. My job is to spot them, we're a good team!